Today the Senate Subcommittee on Space, Science, and Competitiveness, chaired by Senator Ted Cruz (R-Texas), held the third of a series of hearings on the future regulatory framework required for American commercial space to prosper. In today’s hearing the witnesses in general once again called for a variety of reforms that would simplify the regulatory process for private enterprise. Dr. Moriba K. Jah, associate professor from University of Texas at Austin, suggested removing NOAA’s veto power on remote sensing, something that the proposed House bill I analyzed in my Federalist op-ed actually does). Jeffrey Manber of Nanoracks suggested giving the private sector a certain date when ISS will be decommissioned so that they can more easily obtain investment capital for building the privately-built space facilities that will replace it. Tim Ellis of Relativity, a company trying to build rocket engines manufactured entirely by 3D printing, called for more American spaceports, accessible by private companies, as well as a simplification of the FAA permitting process. Robert Cabana, Director at the Kennedy Space Center, talked about the need for government facilities to provide the infrastructure for private companies, as the center has done for the private launch sites and manufacturing facilities they have helped get established at Kennedy since the retirement of the shuttle. Tim Hughes from SpaceX topped them all. His list of recommendations for future deep space exploration almost appeared to be stolen directly from my policy paper, Capitalism in Space, Private Enterprise and Competition Reshape the Global Aerospace Launch Industry. The government should emulate NASA’s COTS program, using simple Space Act Agreements for any future projects, with limited funding that is fixed price with payments made only upon meeting certain goals. 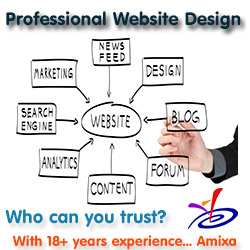 It should buy the products from private companies instead of designing and building them itself. It should leave ownership to the private companies. It should encourage competition by awarding these contracts to multiple companies. And it should give contracts to both established as well as new companies. I am not complaining that his recommendations mirrored mine so closely. Instead, I am thrilled, because it means that increasingly these ideas are becoming the accepted approach by all concerned. Hughes might have read my paper, but I doubt it. I think SpaceX and its management have wanted this to be the approach since day one of that company’s dealings with the government. Unlike the first two hearings, the subject of the Outer Space Treaty was hardly mentioned. Instead, the focus was on the federal government’s future space policy, in particular how it will replace ISS as well as encourage American interplanetary exploration and settlement in future decades. With both, the approach for doing these things was assumed to be the private sector. ISS will be replaced by many different privately-owned orbiting facilities, making money providing many different services to many different customers, both public and private. Deep space habitats, interplanetary spaceships, and future colonies on other worlds might be proposed by the government, but they will be built by private enterprise. What everyone at the hearing, both Senators and witnesses, was trying to figure out was how the government could best make this future happen. The big question was how to balance the government’s needs with the private sector’s. It is clear that no conclusions here were reached. What is also clear — and far more important — is that it appears that in NASA’s competition between commercial space (cargo and crew to ISS) and government space (SLS/Orion), commercial space has apparently won. No one, including the ranking committee Democrat, Senator Ed Markey (D-Massachusetts), was talking about another big government program to go to the Moon. Instead, it was assumed that the future settlement of the solar system by Americans will be accomplished by many different private American companies, for their own profit as well as for the government’s needs. The battle now will be to keep the balance between private enterprise and the government leaning towards private enterprise. We must never again make the mistake of allowing NASA and the government to run and control everything. It’ll be pretty interesting to see what the division of the launch contracts looks like in five or six years when Blue Origin is (hopefully) flying. I wonder if perhaps BO will initially launch at a loss to get a foothold into the market? Bezos certainly has the money to do so. The philosophy of NASA and government running practically everything space related in America almost destroyed the American launch market and allowed Arianespace to gain most of the commercial market three decades ago. Since then, Landsat has been replaced by several commercial companies that do a better job, Iridium has a large contract providing military communications, NOAA’s weather satellites are soon to be replaced or supplemented by commercial satellites, and SpaceX is becoming so amazingly successful that it out launches every country — including the United States, if SpaceX’s launches were excluded from the US count. As Robert’s post says, the International Space Station will be replaced by commercial space stations, which will be able to provide more services to the scientists, engineers, and product developers than the multi-government run ISS has done. That is saying a lot, since there are thousands of experiments done on the ISS. Government run space is not only less efficient, but it stifles innovation. That is a good chart. 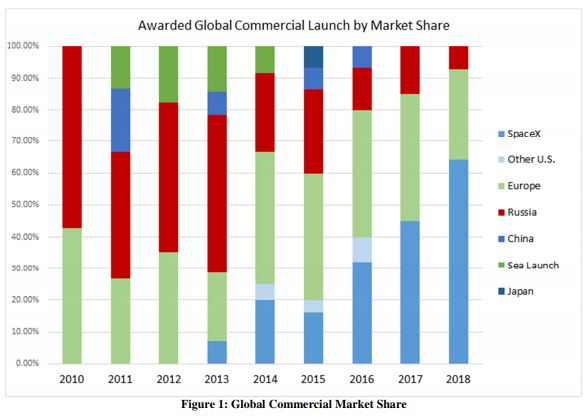 If I understand it correctly, it shows orders for commercial launches through next year (although it may be missing the new small-sat launchers, such as for the Google Lunar X-Prize participants, and a few other nations, such as India). It means that commercial satellite companies are increasingly favoring SpaceX’s price, availability, and quality over government-run launchers. This ties in with Robert’s declaration that we must never again make the mistake of allowing governments to run and control everything. Commercial satellite companies are showing their agreement with that sentiment. A launch every two weeks in 2017 and a higher rate planned for 2018. And Spacex satellites! The government-space-program-business-as-usual enemy is definitely on the defensive. I think events of the next two or three years will pretty definitively seal its fate. The business-as-usual enemy is because the older space programs are playing it safe. SpaceX has been trying new and innovative technologies and techniques, taking risks that the old programs were unwilling to take. I expect that SpaceX will eventually settle into its own play-it-safe mode as its customer base insists upon reliability over innovation, but I also expect newer companies to come along and be innovative. Blue Origin could be the next company to try what will be new and innovative. I often refer to Skylon as another innovation to try. When competition is the driver, improvement becomes necessary. When government is the driver, improvement quickly becomes unnecessary and even discouraged. SpaceX is owned by an entrepreneur. (Look up Isambard Kingdom Brunel for comparison). The communist “economic” theories about how collectives work do not apply to an individual (and obviously don’t apply to anything to judge from the track record of the FED’s forecasts). He’s got his own mind. He’ll do his own thing. It is genuinely unpredictable because everyone’s mind is neither bigger nor better than any other one’s. One mind cannot figure out another mind. Best case is that you are busy figuring out your own mind (what is it up to? Crazy stuff!) SpaceX won’t settle until he himself lands hard on Mars and his lazy inheritors take over. Have you heard of CAPM? The assumption that everyone owns the same assets. It is a horrible mental sickness and it is epidemic among “students” of economics in the universities. It does make the math simple, but it unfortunately has nothing to do with reality. False assumption = false conclusion and total failure. If you compare the exploration and colonization of the New World to today’s space effort they are very similar. Governments financed the first exploration and colonies for over 100 years. Then private enterprise took over and it still took years for stable self sustaining colonies to be established. I am expecting a few private space stations and then a self sustaining lunar colony in 50 years. At that point we better have a plan to get to another star system with manned ships. I don’t have to figure out Musk’s mind. SpaceX has already told us that they will stop innovating the Falcon 9 after the block 5 version comes out. Which would prove my point to be true, that eventually SpaceX will play-it-safe, and for the sake of keeping its customers. No, and I cannot find references to it, but if everyone owns it, then no one owns it. In fact, such a philosophy allows government to declare sovereignty over it, and everyone stops owning it. Robert Zubrin makes that case. He believes that space colonists will have to live off the land as much as they can, just as New World colonists did. A big difference is that there will be less existing flora and fauna to live off of. I am more optimistic on the timeline for a colony than pzatchok, but I think that there will need to be unmanned interstellar reconnaissance probes, taking many more decades, before we are willing to plan an actual manned interstellar mission.